The Official Xplanation/Xcuse – A Missile MOVING at TWENTY MILES PER SECOND?! Even if it was located just past the mountain in the photograph, roughly six miles away, the velocity of the spiral would have to be at least 710 miles per hour -- which is over twice as fast as the world-record wind speed, from directly inside a tornado. 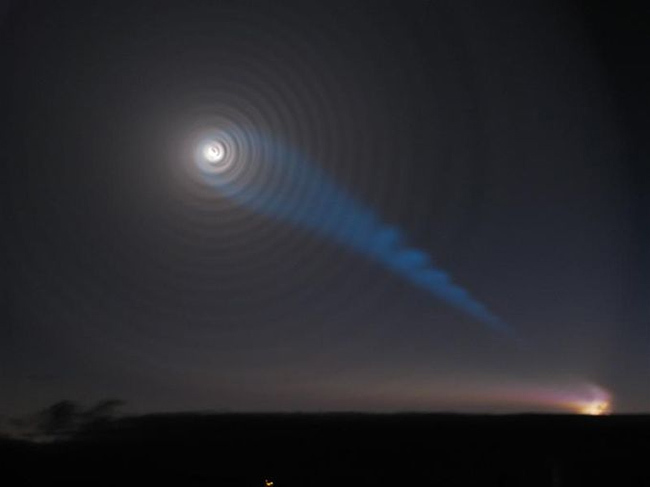 If the Spiral was caused by a missile from the White Sea, as the conventional explanation insists -- a location which is fully 100 times farther away -- it would have to be rotating at more than twenty miles per second! The [sea level] speed of sound is clocked at 761.2 miles per hour. Anything over the speed of sound would have caused tremendous sonic booms -- but the Spiral was completely silent. So, if it's not a missile, then what are we left with for an explanation? The answer is much more straightforward, and easy to prove, than you may have thought. It just involves some 'new' technology that is only now being revealed to the public -- via the "show, don't tell" principle. As I pointed out on our December 10th Whistleblower Radio program, Richard C. Hoagland discovered something that should be standard fare for every discussion about this -- namely that the island of Tromsø, where the Spiral was most visible, "just so happens" to be directly northwest of a major HAARP facility called EISCAT. What might happen if each of those antennae had the ability to be precisely aimed in a certain direction (they do) -- and you had at least one GIGAWATT of power to play around with? In case youdon't already know, HAARP stands for "High Frequency Active Auroral Research Program," and its purpose is to shoot huge amounts of energy into the charged particles of the ionosphere -- for "ionospheric heating." It has long been suspected of having far greater functions and abilities than those which are openly being acknowledged, and I've heard some of this testimony from insider witnesses myself. The European Incoherent Scatter Scientific Association (EISCAT) operates an ionospheric heating facility, capable of transmitting over 1 GW effective radiated power (ERP), near Tromsø in Norway. 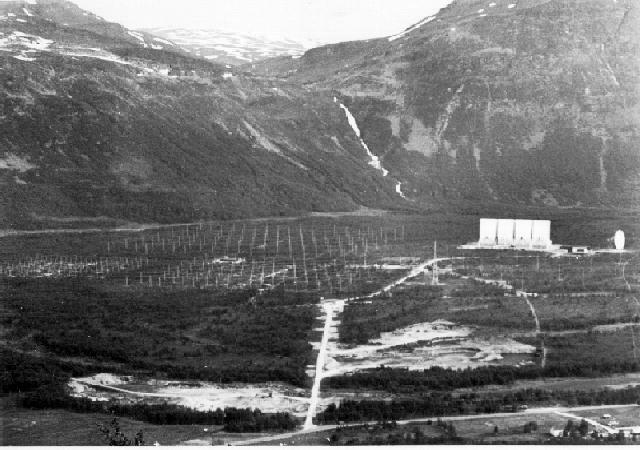 Is it another "coincidence" that, just over the hill from Tromsø, lies a high-tech Norwegian "HAARP antenna farm" -- the EISCAT Ramfjordmoen facility (below) -- specifically designed to broadcast powerful beams of microwave energy high into space ... thereby also creating blatant HD/torsion side-effects in the Earth's highly-electrified upper "plasma" atmosphere (ionosphere)? The facility is officially supported by Norway, Sweden, Finland, Japan ... China ... the United Kingdom ... and Germany. As Hoagland just indicated, we now know that Japan and China are two of the countries who are "officially supporting" the EISCAT facility -- and with China's support, that easily means Russia could be involved as well, thanks to their fairly recent and growing alliance with China -- an alliance which insiders insist is intended to counter the New World Order / Illuminati. 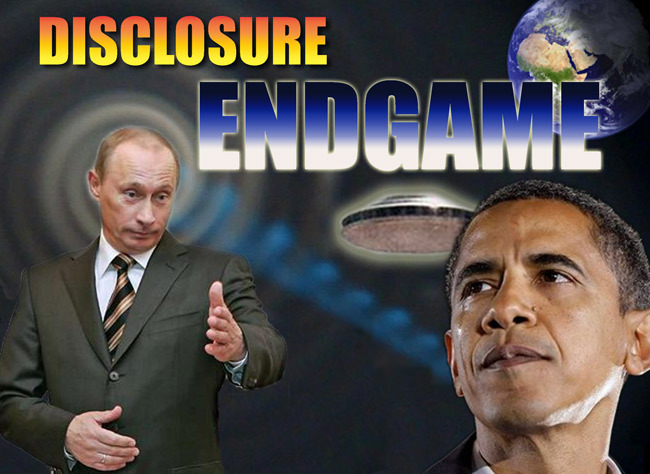 Therefore, this could very well have been done by those who are openly and actively opposing the New World Order / Illuminati agenda, according to the testimony of controversial figure Benjamin Fulford as well as others -- such as Disclosure Project's Dr. Steven Greer, who has also said there is a very strong push for Disclosure coming from the new Asian alliance. Still not convinced? It gets better: the EISCAT ionospheric heating facility documented a major surge of power usage -- right as the apparition was happening. 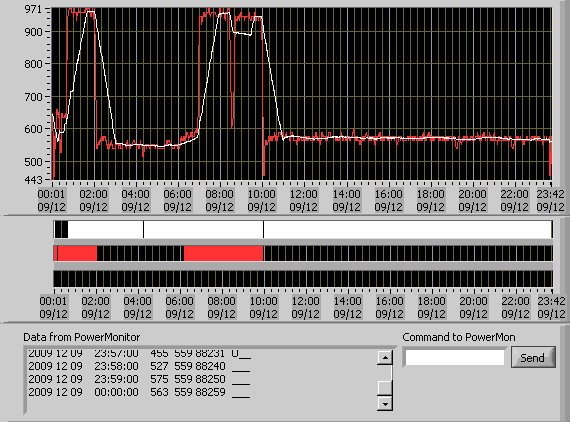 The power surged up to the maximum level the EISCAT facility is capable of generating -- nearly a gigawatt. We also know the luminous beam had to be coming from the ground up, due to simple physics. The "right hand" rule means that if you stick your right thumb straight ahead of you, aimed in the same direction as any electromagnetic beam you're studying is traveling, the magnetic field of the beam will always rotate in the direction your fingers are pointing -- namely clockwise. We know there had to be a plasma discharge in the ionosphere due to the extended 10-15 minutes of stable, ongoing brightness that appeared in the sky. In order to get brightness like that, you need charged particles of one kind or another. And obviously, charged particles are beholden to the basic laws of electrodynamics. Therefore, thanks to the physics of electromagnetic energy, we know it could not have come from a satellite. If a satellite were trying to project such a formation, the beam would have to be rotating backwards -- and this would violate the intrinsic laws of electromagnetic field behavior. If you carefully study this incredible, unenhanced image from an excellent series of photographs that emerged directly after the event on the Norwegian Altaposten website, you can clearly make out at least eighteen, and as many as twenty perfectly concentric layers in the spiral, by looking from bottom to top -- just to the left of the second street-light from the top, up to the center of the spiral. No one in the mainstream media has pointed out this photograph. The spiral is much, much too perfect and multi-layered to support the official explanation that this is a rocket gone haywire. It's utterly laughable to think a missile could have done this. The ionosphere is not thick enough -- not viscous enough -- to hold a spiral of exhaust this cleanly and tightly together, composed of geometrically-perfect circles, with at least 18 concentric layers hanging there in the air for 10-15 minutes. We already know the spiral is rotating much too fast, at either potential distance, for even one layer to have been caused by missile exhaust -- thanks to Arash Amini's research paper. And we still have to explain how the blue 'corkscrew' beam also hung there, perfectly, for 10-15 minutes, as we said before. Many comparisons were made to UFOs, wormholes, stargates, portals through space and time, et cetera, and for good reason. At the end of the display, the center of the spiral suddenly disappeared. It widened in a sudden, absolutely perfect circle that was very, very 'alien' looking -- not at all like something you'd see from a rocket. In addition, if you squint your eyes and study the above image very closely, faint traces of the same substructure of spirals can clearly be seen. They are visible to a lesser degree on the bottom left, and to a greater degree on the top right of the black hole in the center. Unfortunately there isn't quite enough pixel data in this image to bring it out in greater contrast, but you can definitely see there are many, many layers of spirals in the formation. Based on a rough calculation of how thin each of the layers are, and how far out they appear to go, there could have been as many as 40-50 concentric layers in the spiral if you had been in the right place, at the right time, to photograph this event. In the face of all the scientific evidence to the contrary, some will still undoubtedly want to believe that missile exhaust could do 40 perfectly concentric layers that would hold up in the Earth's ionosphere without dissipating for up to 15 minutes. That's fine. The bigger question becomes this -- is there any other technology that could have potentially created this formation as well? The answer is... most definitely... Yes. CAN SUCH AN APPARITION BE CREATED BY IONOSPHERIC HEATING? This interesting article from India Times revealed that publicly-announced HAARP experiments had indeed created a complex visual apparition of "surprising luminescent bands radiating out from the center of a bulls-eye." Sound familiar? The technique has previously triggered speckles of light while running at a power of almost 1 megawatt. But since the facility ramped up to 3.6 megawatts -- roughly three times more than a typical broadcast radio transmitter -- it has created full-scale artificial auroras that are visible to the naked eye. But in February last year, HAARP managed to induce a strange bull's-eye pattern in the night sky. 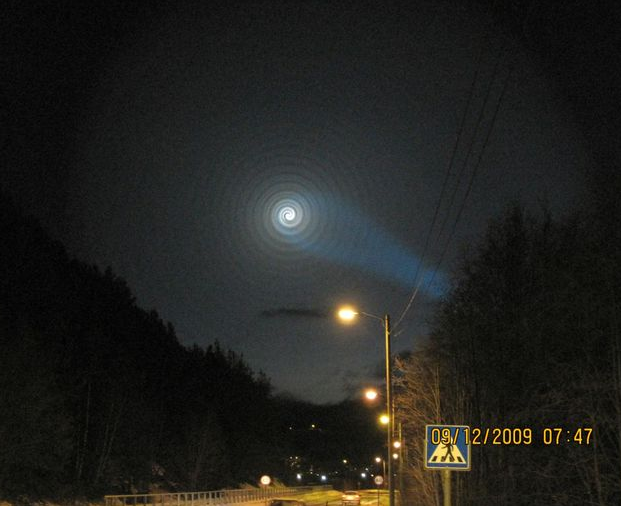 Instead of the expected fuzzy, doughnut-shaped blob, surprising irregular luminescent bands radiated out from the centre of the bull's-eye, according to Todd Pedersen, a research physicist at the US Air Force Research Laboratory in Massachusetts, who leads the team that ran the experiment at HAARP. The team modeled how the energy sent skywards from the HAARP antenna array would trigger these odd shapes. They determined that the areas of the bull's-eye with strange light patterns were in regions of denser, partially ionized gas in the atmosphere, as measured by ground-based high-frequency radar used to track the ionosphere. 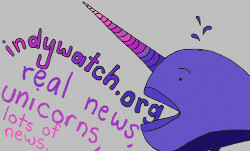 The same article, more or less, can be found on BritainNews.net -- but hardly any other mainstream site on the Net covered it in such specific detail. The article says these curious bulls-eye, luminous-banded patterns will appear where you have partially ionized gas in the atmosphere. Tromsø is at the very northern tip of Norway, close to the North Pole -- and there are a great deal of ionized particles in the atmosphere near the poles, forming the aurora borealis. Therefore, we already have the proper conditions in the sky over Norway to create a visual manifestation of a "bulls-eye" with "surprising irregular luminescent bands that radiate out from the center." And since EISCAT's gigawatt is equivalent to a thousand megawatts, and the above formation started taking shape at only 3.6 megawatts, you can start to imagine what wonders you could create when you now control 277 TIMES more power than it took to create Dr. Pedersen's HAARP bulls-eye with luminescent bands. Dr. Pedersen's research was conducted at the US Air Force Research Laboratory, which happens to be at Wright-Patterson Air Force Base. We know this thanks to a brief update in Physics Today -- "HAARP Creates Bulls-Eye in the Sky". The Physics Today update in turn links to this article in the Nature science journal, which is only accessible by a paid membership. We have not yet been able to find a single genuine picture of the results of this HAARP experiment itself -- nothing. Wright-Patterson has long been associated with various classified projects related to the UFO cover-up -- going all the way back to the infamous Roswell crash, where the debris -- and the occupants alleged to have been inside it, some alive and some dead -- was allegedly taken to the infamous Hangar 18. There's a whole History Channel documentary about it at this link. This is definitely not the action of a mainstream Russian media [outlet] attempting to push this story aside as being merely caused by a stray missile. At least one major faction within the Russian government wants the UFO / paranormal connection to be explored -- and Google ads are going to be distributed throughout many thousands of UFO-related blogs and websites. As we shall see later on, it is also important to remember that India was one of the main countries to 'leak' this new information about HAARP creating a bulls-eye formation with luminescent bands in the sky. Notice the direction? Yes. Clockwise, when seen from the ground up. Just as we knew it had to be. Just as the Norway Spiral. Both the blue corkscrew and the white spirals in the Norway formation can be explained by extrapolating from these animations. They are an electromagnetic phenomenon, not an atmospheric one. They therefore can maintain the 710-mile-per-hour velocity, since they are being projected onto reflective particles in the air, rather than being caused by the rotation of loose particles within the air itself. When we use only the positively-charged field, the concentric layers of the spiral hold together, rather than continually pulling apart as we saw in the first animated graphic above. The only reason why the spiral appears to dissipate at the bottom of this computer simulation is that this close-up view isn't wide enough to show the continuing expansion of the spiral. Since this type of HAARP-created spiral holds together cleanly in the ionosphere, over a large distance, (all of Alaska and a good bit of northern British Columbia in the first graphic), the resulting effect could end up looking just like the Norway Spiral. And remember -- if we are being allowed to see this aspect of HAARP technology on the Internet, then there may very well be other aspects to it that are much more classified... as many insiders and researchers have asserted. In time, we may find out that these spirals are only one of the simpler tricks you can pull off with HAARP, once you know what you're doing. The new kids on the block, with their own EISCAT facility to play around with, may not have as much know-how as the old school UFO cover-up guys in the military-industrial complex -- in fact, they may only have learned how to manufacture such a formation with HAARP some time after August 2008, as we shall discuss -- but they certainly created quite a sensation -- worldwide -- with the Norway Spiral. 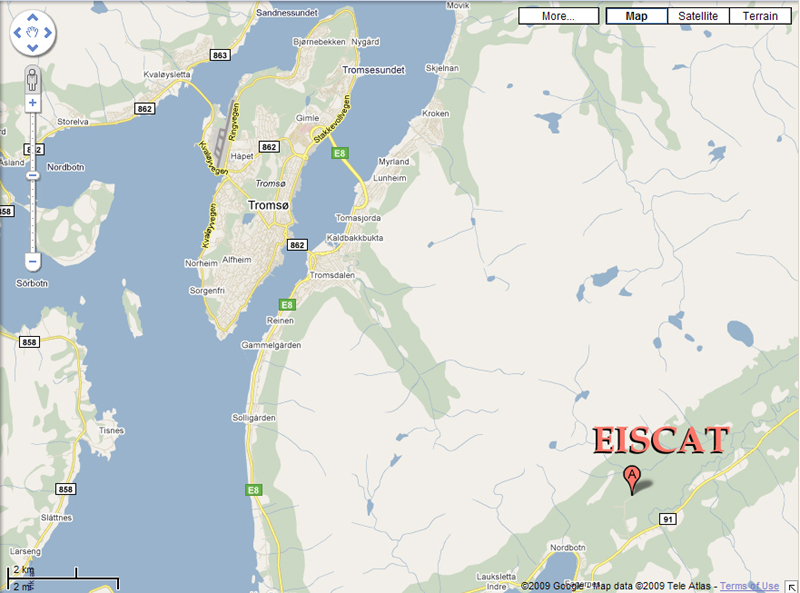 WHERE IS EISCAT LOCATED RELATIVE TO THE NORWAY SPIRAL? Arash Amini did not mention Hoagland's discovery of the EISCAT facility in his paper. He obviously did not visit Enterprise Mission and read the article, which gave the exact location of the EISCAT facility on a map. Otherwise, if Amini had read Hoagland's report, he almost certainly would have mentioned this stunning correlation. Remember -- thanks to Google Earth, our skeptic Kevin Martin found exactly where the mountains were in the above Norway Spiral photograph. Arash Amini included a map of where Kevin's mountain peaks were located in his paper. Hoagland was not aware of Kevin Martin's discovery of the exact location of the mountains when he wrote his paper, as it hadn't been published yet. That's right. 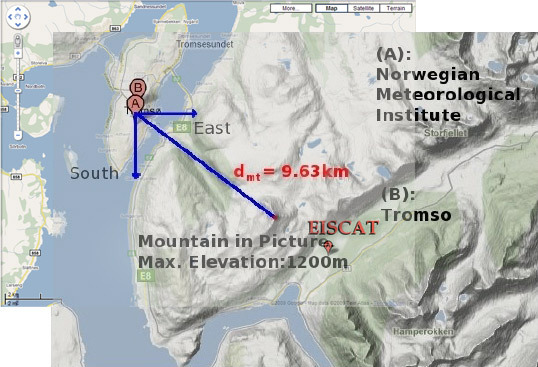 The EISCAT facility is absolutely dead-center on Amini's line from Tromsø, where the picture was taken, to the tops of the mountains seen in the picture. The bottom of the Norway Spiral is precisely above EISCAT. At this point there can be no doubt. EISCAT definitely was responsible for the Norway Spiral. X marks the spot. If all this is so easy to prove, then why were we told it was a missile? What are 'they' trying to hide here? Let's go back to the people running EISCAT itself. Did they try to cover up the fact that they were using their facility -- at maximum power -- that morning? What the heck was going on in the morning of December 9, 2009 that caused their power consumption to surge to nearly one gigawatt? Guess what? EISCAT did indeed schedule an event for the morning of December 9, 2009 -- during the exact time the Spiral appeared. 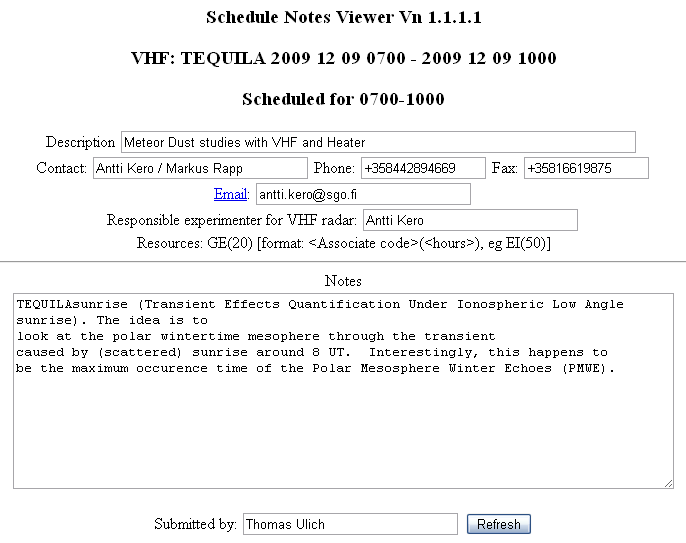 They were zapping the mesosphere with Very High Frequencies (VHF) so they would light up the sky like a "Tequila Sunrise," and they would then record plasma density and temperature in the area. The timing of the experiment was chosen for when there would a maximum amount of charged particles in the atmosphere, thanks to the 'meteor dust' from the "polar mesosphere winter echoes" (PMWE) -- thereby making the glow even brighter, since these conditions were quite literally ideal for creating any airborne projection. If you still somehow think the Norway Spiral could not have been anything more than a missile, then where was the "bulls-eye spiral with luminescent bands" that we should have been seeing in the sky during this exact same time? Shouldn't we have seen a spiral that was much brighter and more powerful than HAARP's openly-acknowledged test, which was only 3.6 megawatts as opposed to nearly 1000 megawatts pumped out by EISCAT? OK... let's say you really are ability-impaired when it comes to believing your government and media are lying to you. Either way, isn't it 'fishy' that Tequila Sunrise "just so happened" to be tested at the exact same time the Russians tested one of their Bulava missiles -- in exactly the same spot? If the Norway Spiral was only caused by a missile, then what the heck happened to Tequila Sunrise? Where did it go? If all the conditions were right, and it was the most ideal time of the entire year for EISCAT to create a big, bright spiral in the sky, then how come we didn't see a thing -- but then a stray missile somehow miraculously broke all known laws of physics, with its exhaust rotating at an impossible 710 miles an hour, to create the very same spiral phenomenon as HAARP does -- if you believe the mainstream media 'spin'? Doesn't it become quite a 'conspiracy theory' to think that right in the middle of a HAARP test being conducted that could easily form a luminous spiral in the sky, since it was the perfect time of year to do so, that something else came along instead -- and created exactly the same effect? If we push these facts hard enough, and get the new case into the mainstream media, will they then have to make an embarrassing 'retraction', changing the story yet again -- to suit the progress of our independent, community-funded, grassroots research? Does this not sound just like the ever-changing official explanation for the Roswell crash, where the original "weather balloon" cover story had to keep transforming as the research got better and better -- so it's now Project Mogul, where ET-like crash dummies were dropped from the sky inside a completely different top-secret weather balloon project? WHAT ELSE CAN HAARP DO? 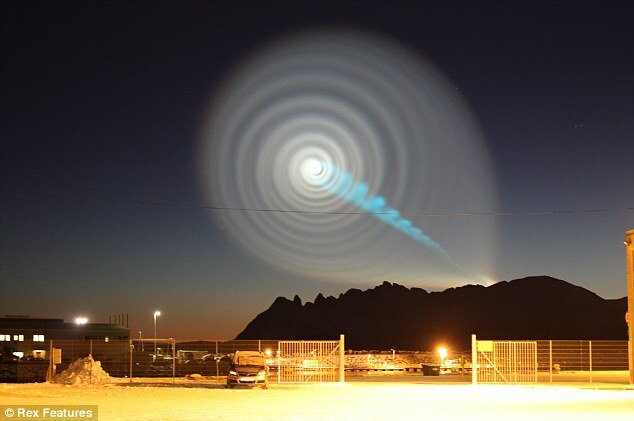 Might this variety of super-powered 1000-megawatt HAARP spiral also have the added benefit of creating a missile shield -- thereby explaining why the Russian Bulava test was deemed to be a failure, if it did even happen at all? Did the Russians deliberately shoot their missile into Project Tequila Sunrise, to see if it would indeed blow up and destroy the projectile? And if so, isn't it interesting to demonstrate such a technology right before President Obama accepts the Nobel Peace Prize -- proving that they now have a working "Tesla Shield" technology that can defeat any threats that the "New World Order" might try to throw at them -- nuclear or otherwise? And if you can indeed knock out something as solid and resilient as a missile with this technology, what could you do to the weather? Or to seismic fault lines, if you bounced your beam off the ionosphere and then aimed it back down towards the ground on a triangulated point? This is precisely what many insiders say HAARP is really being used for -- weather modification and 'natural' disasters. This research article is a preliminary step towards establishing such a connection, despite making some huge and unlikely leaps in logic by tying in worldwide events that HAARP may or may not have been responsible for. The program will study radio waves generated by the HAARP transmitter in Alaska. These waves will propagate through several important physical layers beyond the earth’s atmosphere. By operating a receiver at the magnetic conjugate point where the waves are most likely to return to earth, we will develop significant scientific understanding of those layers and the processes that affect them. Therefore, it may well be possible to generate HAARP effects that could potentially be strong enough to knock out a Russian nuclear missile. These same waves could also potentially hit certain locations around the world -- including seismic fault lines -- by directing them at various magnetic conjugate points. Another point to consider is that this type of "missile shield" might not normally be visible -- but under these ideal conditions with all the charged meteor dust in the ionosphere, we could then see it with the naked eye. If this is so, then perhaps such technology is being used a lot more often than we realize. Could this HAARP technology, or some variant of it, be used to create far more complex visible formations than just the Spiral? This definitely proves that very large, complex and stunning holograms can be created in the sky -- if you have the right technology and/or conditions to create a reflective environment in the atmosphere -- like the 'meteor dust' present in the northern latitudes around Norway. HAARP may or may not have the capability of doing this -- but it certainly could be done with existing technology. WAS THE KREMLIN PYRAMID A GIANT HOLOGRAM? The Japanese used water vapor to bounce their holograms off of. And on December 9, 2009, there was plenty of "meteor dust" in the northern latitudes over Norway and Russia to create a reflective surface for a potential holographic technology to bounce off of -- more than any other time of the year! Thus, it is certainly possible that the tetrahedron-shaped triangular 'pyramid' over the Kremlin (see Part One) -- which appeared that very same day, when the dust in the northern latitudes was at an all-time peak for aerial phenomena to be produced -- was a similar holographic technology at work. A tetrahedron is called a 'primitive' in computer graphics, because it is one of the simplest and easiest shapes to make there is. This might also explain why it looks somewhat fuzzy and indistinct in the two available videos from Russia -- it was a hologram! Since the Norway Spiral was clearly manmade, it becomes much more likely that the Kremlin Pyramid was also manmade -- by simple logic. They are two visual aspects of the same overall plan, which both appeared the same day. And if that level of manifestation doesn't produce the desired result, we can expect that even more will happen later on. You have absolute proof that the arms of the Spiral could not have been missile exhaust -- they were rotating at no less than 710 miles per hour. You have a HAARP facility right below where the Spiral manifested, as photographed from Tromsø, Norway. You have an electromagnetic beam with a clockwise spiral, which proves it had to have come from the ground up. You have pictures clearly showing the beam appearing to be 'projected' from the ground, where everything tapers down to a bright center point. You have open acknowledgement in Indian mainstream media that HAARP can create 'odd shapes' of "luminescent bands radiating from the center of a bulls-eye" that are visible to the naked eye -- at only 3.6 megawatts. You have the EISCAT facility capable of doing 277 times more power than HAARP needed to create a "bulls-eye with luminescent bands". You have the energy readouts showing the EISCAT facility was running at maximum power during the entire time the Norway formation was seen. You have animated graphics from the Office of Naval Research proving that identical spiral formations can be created by HAARP over a gigantic area -- namely all of Alaska and the northern portion of British Columbia. 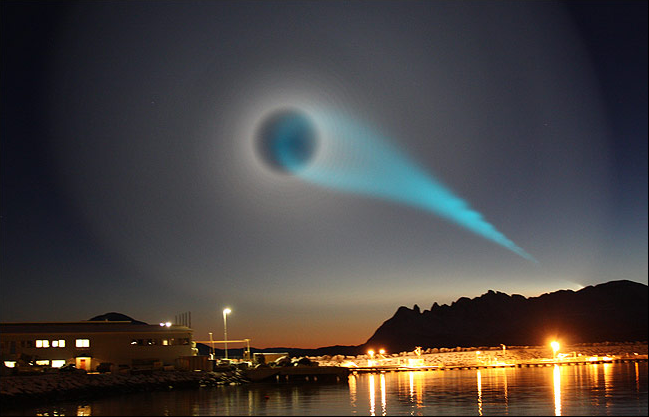 You have 'TEQUILA sunrise', a test intended to light up the sky, being conducted in Norway with EISCAT during the exact time the Spiral appeared. You have the Russians allegedly shooting a missile right into the area where this super-high-powered EISCAT test is taking place -- a missile which promptly blows up and 'fails'. You have video proof from Japan that complex holograms can be projected from the ground into a reflective media in the atmosphere, suggesting HAARP, or a related technology, might be able to do a lot more than just spirals. You have a gigantic tetrahedron-shaped UFO hovering over the Kremlin in Russia for hours... on the very same day as the Norway Spiral. You have the Circlemakers redundantly flagging the exact date, in advance, that the Russia / Georgia war ended in a ceasefire -- August 16, 2008. You have a crop formation clearly establishing a Nazi connection with the Bush regime and the Pentagon -- prior to the results of the 2008 election. You have insider testimony that the Russians acquired a vast treasure-trove of secret New World Order documents in this same August 2008 invasion. You have the possibility that the Russians learned how to create holographic projections with HAARP and other technologies as a result of this "new acquisition" in 2008. You have the possibility that the Kremlin Pyramid was a field-test of such 'new' technology -- on the very same day as the equally-manmade Norway Spiral appeared -- since it was the best time of the year to get results by bouncing these technologies off of the 'meteor dust' in northern latitudes. And lastly, you have both of these stunning aerial formations appear the day before President Obama accepted the Nobel Peace Prize -- in the very same country the Norway Spiral appeared in! The Us & USSR signed a mutual backsplapping treaty banning weather weaponry back in 1978! I am Mr SCHREIBER JAKOBUS by name, i am a citizen of USA, i have been looking for how to join the great illuminati brotherhood for the past 9 months and all i got was group of scams who made me to trust them and the end of the day, they duped me of $5000 without helping me. 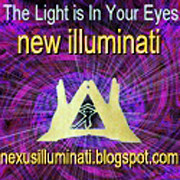 all my hope was lost, i got confused and frustrated, i find it very difficult to feed my family, i never wanted to have anything to do with illuminati on net again, because i never trusted any illuminati on net since i was scam, so i went to borrow some money from a friend i told her all that happened and she said she can help me, that she knows a member that can help me, that she just join the illuminati, she directed me on how to apply i did as she told me, i applied, though i never believed but i tried and to my greatest surprise i was initiate as a member of the great illuminati i could not believe, i am happy and rich today and i am thanking Mr Benson for everything. upon there are scams all over the places, a trusted member like this still exist, please i advise everyone out there who want to join the brotherhood to contact Mr Benson on his Email address (bensonehiz@gmail.com) or on Facebook at (Joel E Benson) and be free from scams. He will never disappoint you. Good news!!! Good news!! 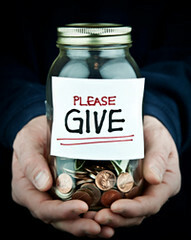 !, Do you want to live a rich,healthy and famous life. Do you want to get rich immediately and be out of suffering? Do you want the world to recognize you and listen to you when you speak? do you want to be in power and control? 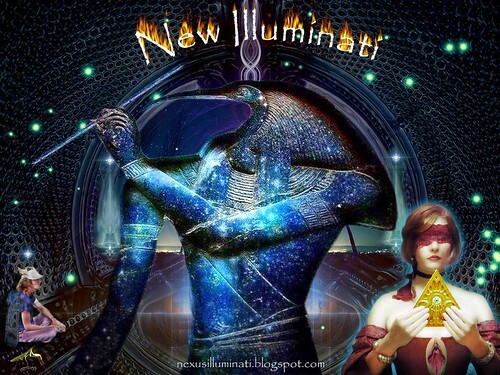 if yes, here is a good tip just join the “ILLUMINATI ORGANISATION”, you may ask “How Can I Join” , the answer is simple all you have to do is to contact us to ELEVATE YOURSELF FROM POVERTY..